A U.K. historian is on a quest to find and reclaim hundreds of miles of protected bike lanes built across his country in the early 20th century and then abandoned. Carlton Reid, the author of Roads Were Not Built for Cars and next month’s Bike Boom, says he’s found 320 miles of abandoned protected bike lanes so far using archived documents and period road maps, then tracked them down on Google Street View. 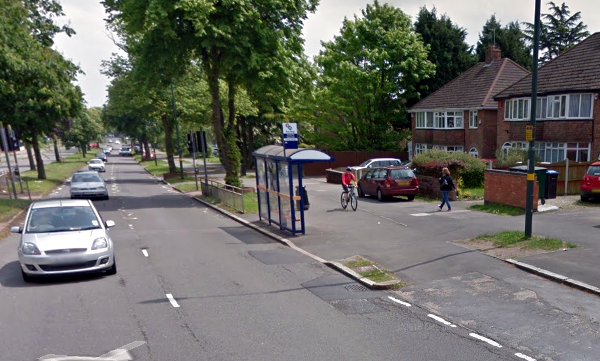 They may have fallen off the maps, but some routes, like this one in Birmingham, are still helping people get around. That’s more mileage of forgotten on-street separated bikeways in Britain than the 300 or so miles known to be in use today in the entire United States. Reid is in the midst of an already-successful Kickstarter campaign raising money for a report about the forgotten bikeways. The protected bike lanes were built between 1934 and 1940, after private cars had become common in richer households but before World War II’s mobilization and aftermath led to a boom in auto-oriented neighborhoods for the middle classes. The pre-war coalition government even brought in consultants from the Netherlands, then as now the world’s experts on building low-stress biking networks. Britain’s lost protected bike lane networks from the Great Depression recall the short-lived protected bike lane boom in many U.S. cities around the turn of the 20th century. That period, also long forgotten, was rediscovered in 2013 by a historian in Wisconsin. 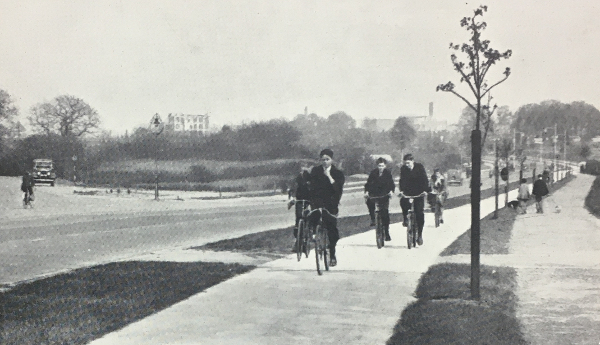 A British protected bike lane in the 1930s, location unknown. Image via Carlton Reid. But as in the United States, Britain’s protected bike lanes eventually fell out of official recognition — though some are still ridden today by people looking for comfortable places to pedal. Reid hopes that his research project will put the stamp of legitimacy on these forgotten routes, leading governments to reclaim them from adjacent property owners, many of whom have appropriated the bikeways for free storage of their own vehicles. PlacesForBikes is a PeopleForBikes program to help U.S. communities build better biking, faster. You can follow them on Twitter or Facebook or sign up for their weekly news digest about building all-ages biking networks. They sure did, and that’s discussed in the Bike Boom book Michael mentions in the second para. There’s also a great photo of one of them in use, but the hi-res original cannot be found by the NYC parks service – it shows lots of people, in work clothes, using a protected bikeway. There are still chunks of them on Long Island–along the Northern & Southern State Parkways; when last I tried them, several years ago, they were in pretty bad shape. The city has an ambitious bike plan. And for the first time, it has resources to act on it.